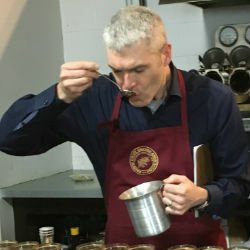 John Moore first began a career in coffee in 1993 roasting a few thousand pounds per week and working as a barista in a small independent café roastery. Since that time he has worked as a barista, coffee bar manager, Director in a publically held company, partner in two others, and managed a vertically integrated international coffee company with coffee farms, mills, roasting and retail operations. John currently works as the Assistant General Manager of Volcafe Specialty Coffee based in New York City and spends his days connecting roasters with producers around the globe.